It might be half a dome, but it’s a full day’s hike – 16 miles round trip from Yosemite Valley with 4,800 feet of elevation gain. Is Yosemite’s much heralded bucket-list hike worth all the hoopla? You bet it is. Half Dome is an iconic element of the Yosemite landscape and the trail to its summit is a one of a kind. 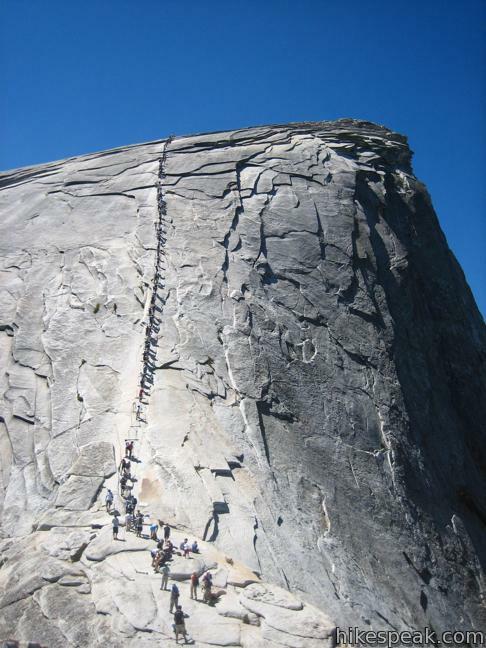 Due to the popularity of the hike up Half Dome, Yosemite National Park has instituted a permit system. Reservations are required every day of the week during the hiking season. First-come first-serve permits are not available, so if you don’t have a permit in advance, you can’t hike to the top of Half Dome. 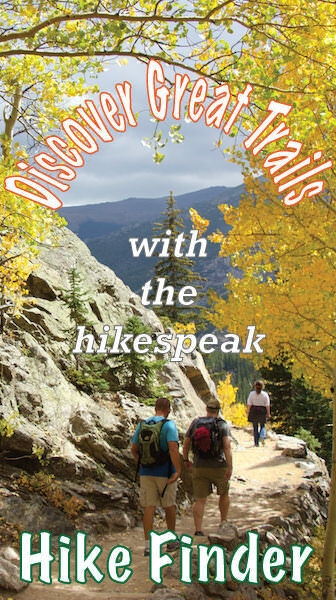 The 300 daily openings are so in demand that a lottery is used to pick who can go on this previously overcrowded hike. 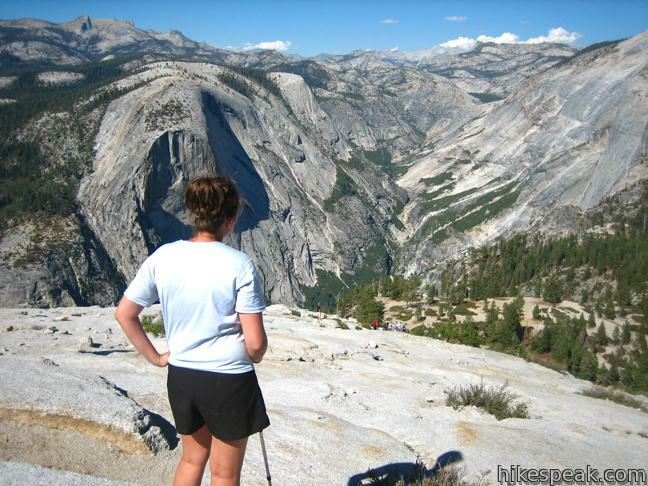 Approximately 225 day hikers and 75 backpackers are allowed to hike up Half Dome every day. 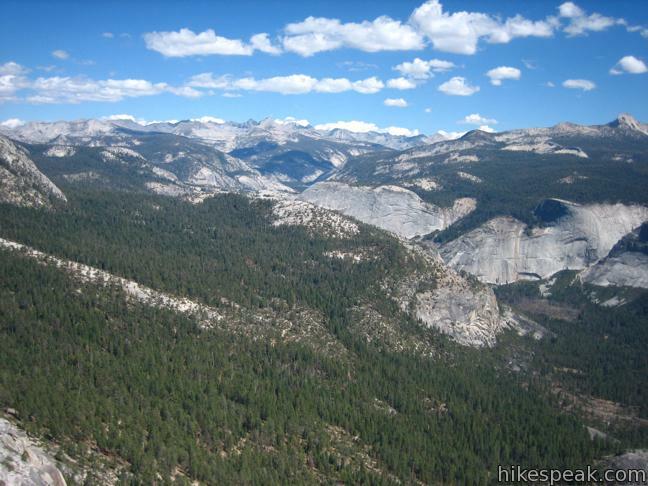 Half Dome permits can be obtained at recreation.gov through a permit lottery. Applications for the lottery are accepted from March 1 through March 31 (to hike Half Dome the following summer). A non-refundable fee of $10 is charged for each application. If you aren’t able to get an application months in advance, you have a second option, the daily lottery. Around 50 permits can become available due to cancellations each day. For this second chance lottery, you apply two days before the hiking date and find out that evening (two days before the hike) whether you are lucky to get a Half Dome permit. To climb the dome itself, you will ascend 400 feet of exposed granite at a roughly 60-degree angle. A walkway of planks and cable hand railings is used to ascend the steep rock. Bring gloves for a comfortable grip of the braded-fiber steel cables. 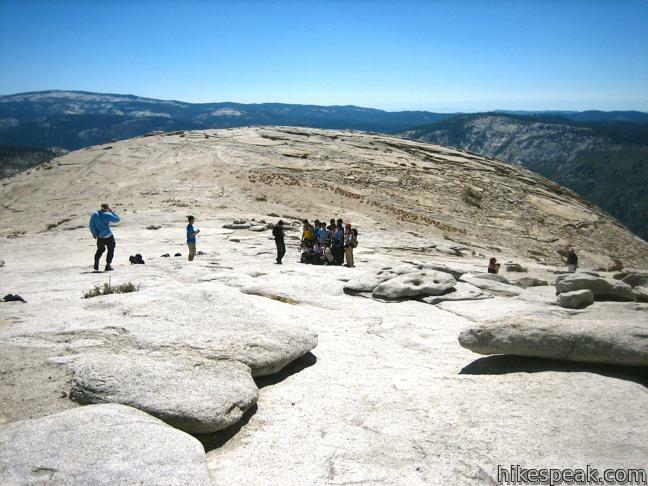 The chains to the summit are taken down during the winter, so the Half Dome hike is only open from late May and early October (depending on the snow). 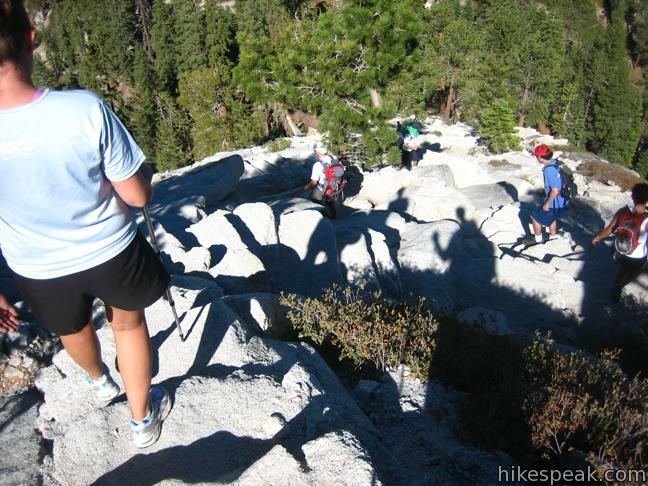 Before attempting the Half Dome Hike, you will likely need to train. It is a marathon effort. In the weeks prior to attempting Half Dome, condition yourself with at least a couple 12 to 14 mile hikes with 2,000 or more feet of elevation gain. 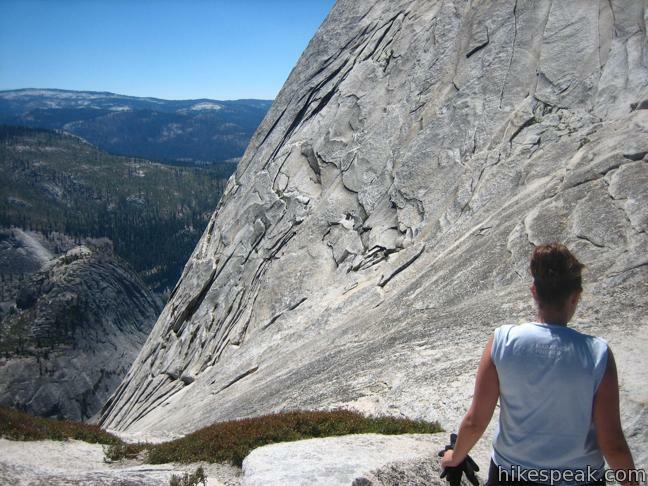 If you are used to hiking shorter distances, gradually build yourself up to a Half Dome-level effort. 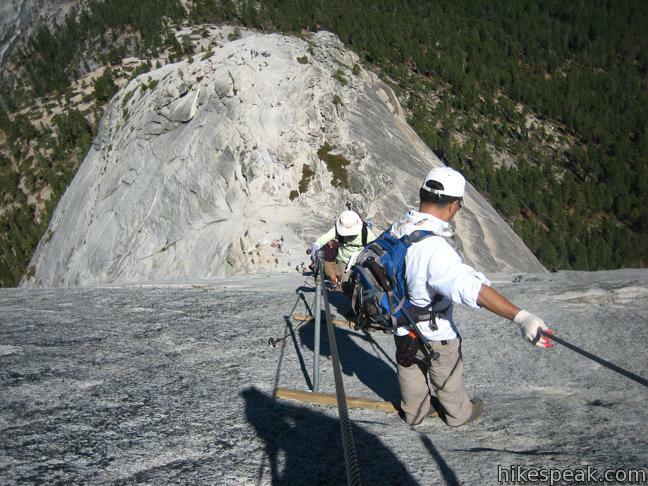 The hike up Half Dome will be more enjoyable and feasible if your body is conditioned for the effort. 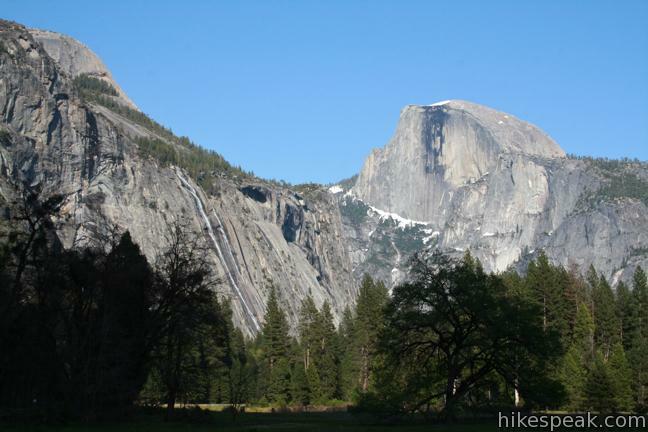 It will likely take over 12 hours to complete your Half Dome hike, so aim to start up the trail before 8 a.m. Pack plenty of water, sunscreen, and food. 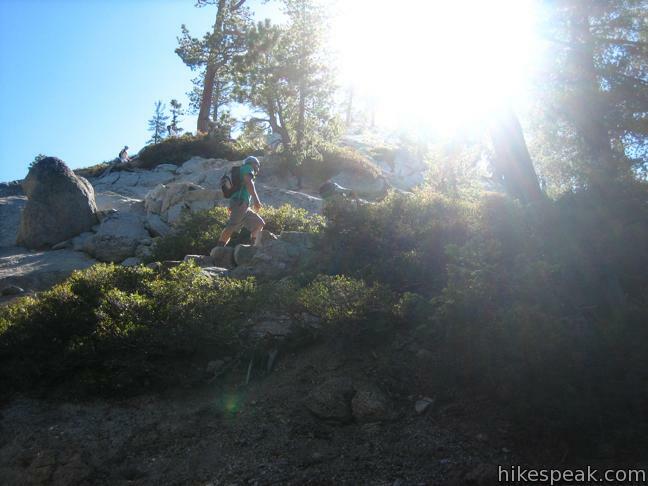 Hiking shoes with good traction are a necessity for steep and slippery sections of the trail. It is a good idea to carry a flashlight and other safety essentials. From Happy Isles Shuttle Stop in Yosemite Valley, turn left and cross a bridge over the Merced River to the start of the Mist Trail on the right (you will pass the trail to the Happy Isles before crossing the bridge). This is also the beginning of John Muir Trail, one of the longest trails in the Sierra Nevada Mountains, going all the way to the summit of Mount Whitney. 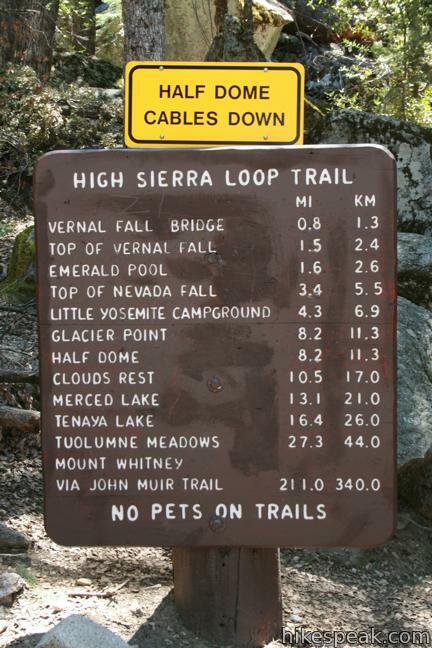 A large sign for the Mist Trail and John Muir Trail makes the trailhead easy to spot. 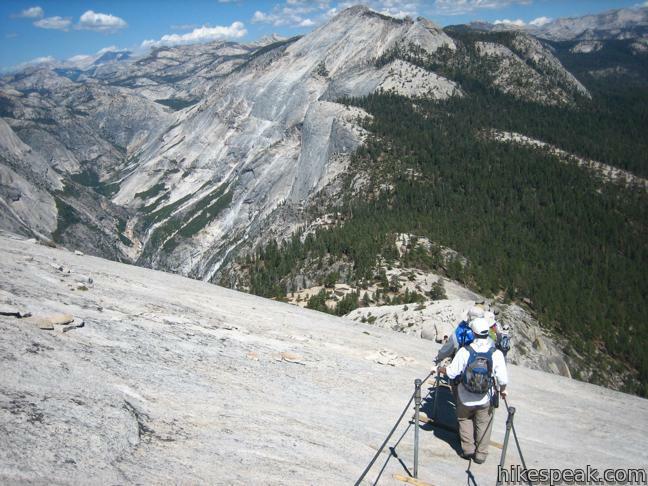 Begin the pleasant but arduous march to the top of Half Dome on a paved path. The opening stretch of Mist Trail entertains with views of Yosemite Falls and Illilouette Fall. After the initial climb, descend to Vernal Fall Footbridge, where you can gaze up the Merced River toward beautiful Vernal Fall. The pavement ends here. 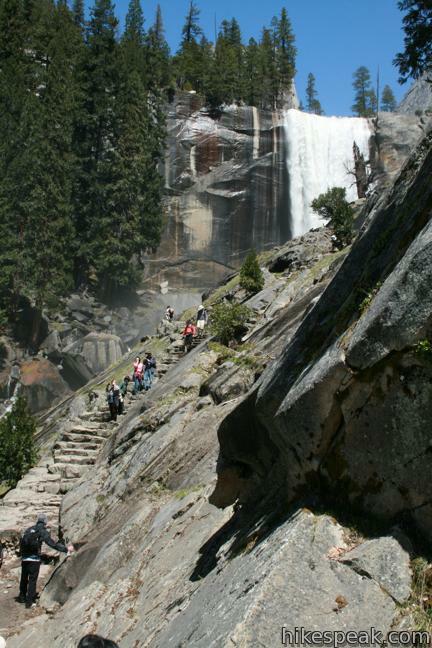 Option 1) Straight ahead, the Mist Trail climbs steep steps alongside Vernal Fall, before climbing upriver past Nevada Fall to rejoin Jon Muir Trail on the way to Half Dome. This is the more exciting route, but it is much steeper. The stone steps are narrow, and are tricky to descend as well, especially when you are tired. 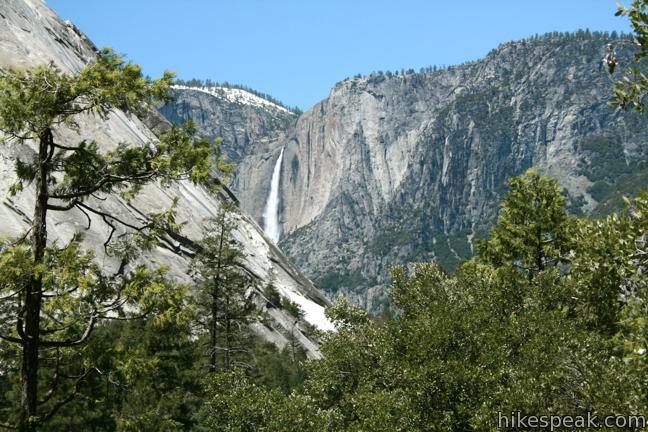 Option 2) John Muir Trail is slightly longer, more gradual, and better suited for the long haul. If you are feeling especially ambitious head up the Mist Trail, but it is probably best to explore that trail on a day when you don’t have so far to travel. 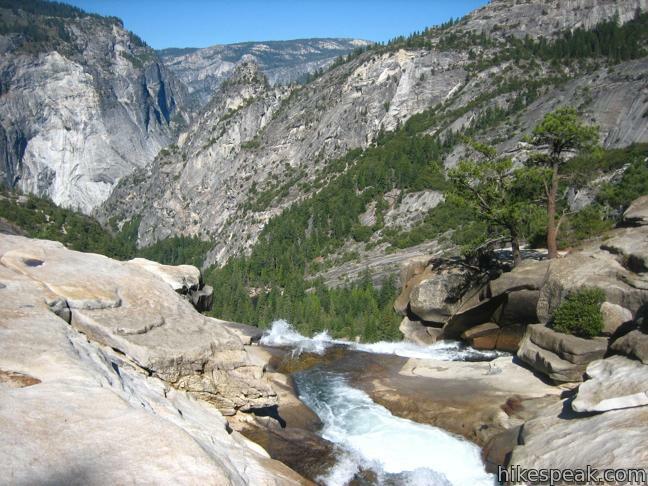 If you haven’t previously hiked the Mist Trail, it is well worth strutting an extra hundred yards up the Mist Trail for a head-on view of Vernal Fall before proceeding on John Muir Trail. Turning right up John Muir Trail, the single track climbs a long series of switchbacks that reward the effort with a direct view of Nevada Fall. 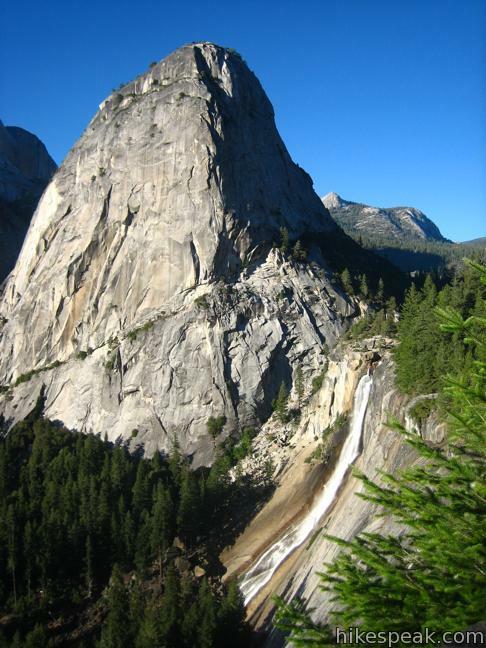 The 594-foot tumbler is cradled to the left by Liberty Cap, a bald granite dome in front of Half Dome. 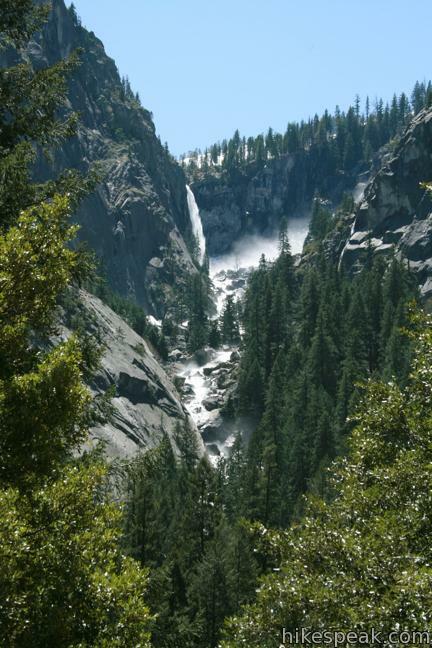 Take in the waterfall-filled view from Clark Point, passing a connector trail that descends toward the Mist Trail along the Merced River below. Continue across a ledge on the right side of the valley above a sheer depression carved by the Merced River. Cross through pines to a junction with Panorama Trail, which rises to the right toward Glacier Point. Bear left and descend a quarter mile to a footbridge just above Nevada Fall. This is a good place to rest and peer over the railing at the observation deck. You’ve climbed 1,925 feet, but somehow, you aren’t even half way. Just over three miles down with about five to go. 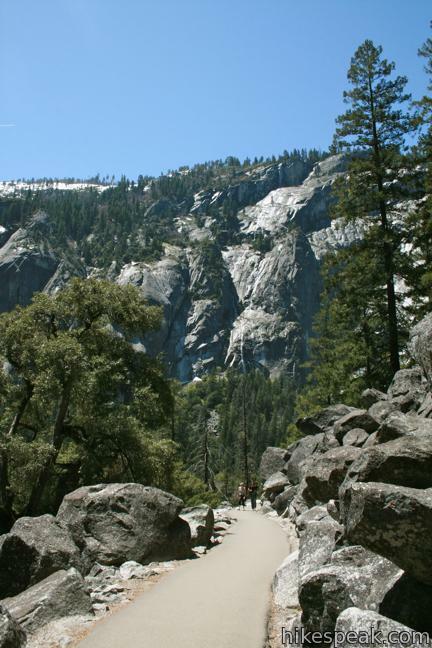 Follow John Muir Trail along the left bank of the river, passing a bathroom and the top of the Mist Trail, a quarter mile past the bridge across Merced River. Slip through pine forest in Little Yosemite Valley. This may be the easiest section of the hike, so enjoy it. Proceed left through a couple junctions by Little Valley Campground (the trail camp nearest Half Dome) and a trail continuing up Little Yosemite Valley. 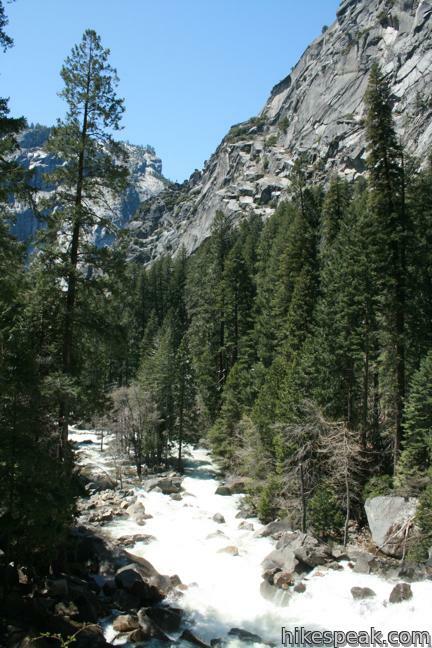 John Muir Trail rises again as it leaves the Merced River. 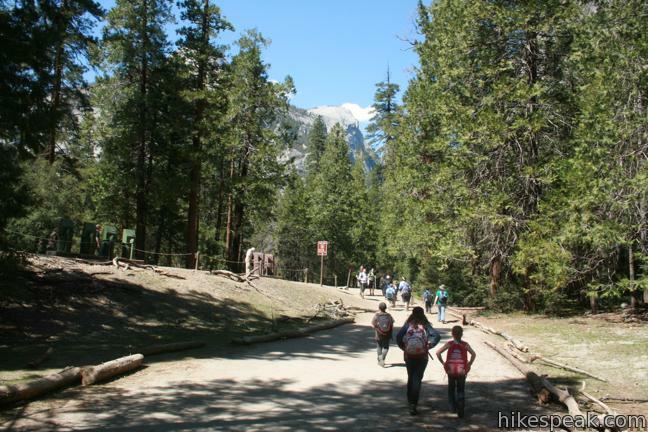 This is a less eventful stretch of the hike, as you cross the forest below Half Dome. After just under 6 miles of hiking, you will come to one last junction. Turn left to leave John Muir Trail for Half Dome Trail. Turn north through tall conifers and ascend Half Dome Trail. 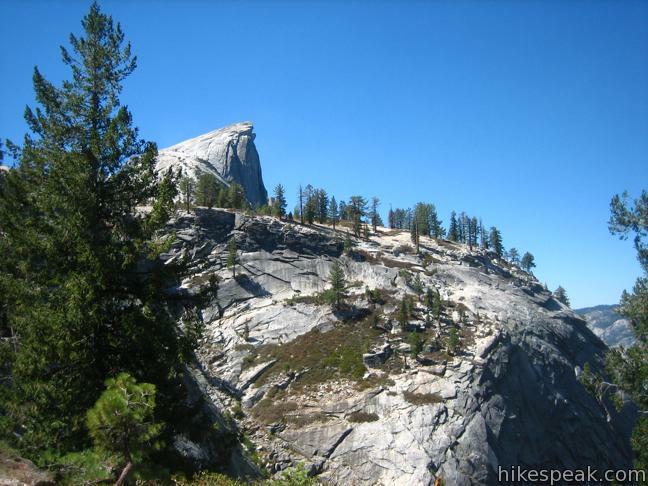 After 1.5 miles, you will exit the trees and reach the base of the sub dome below Half Dome. From here (at an elevation of around 8,000 feet), you get a unique side view the daunting dome. 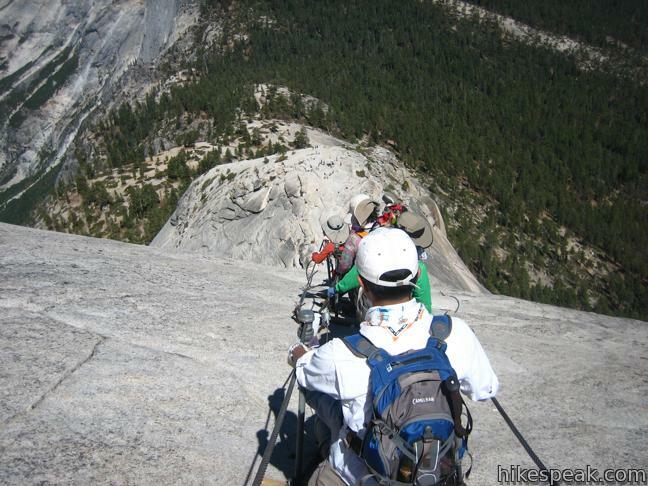 Although you are close, Half Dome Trail presents a couple major challenges on the way to the top of Half Dome. Begin up a series of grueling switchbacks in advance of the chains on Half Dome itself. This is the toughest climb of entire hike. The switchbacks are steep, you are tired, and the rocky slope offers little shade. When you reach the chains, catch your breath, slip on a pair of gloves, and grab hold. Walk up the center between the two cables, spaced about three feet apart. Put one hand on each of the waist-height cables and pull yourself up. Wooden planks are spaced out every six feet. Transition from plank to plank, pausing at each to let the person coming down the chains pass. If everyone follows the system, you can get to the top efficiently. Given the crowding on this trail, it could be a slow process to reach the top. There are a few extra steep climbs, but most of the ascent is at about 60 degrees, which is more than you would want to do without the chains, but not enough to make you cling to the rock face. Do not attempt to climb the cables in anything but perfect weather. They can become very dangerous in an electric storm or even a light rain. 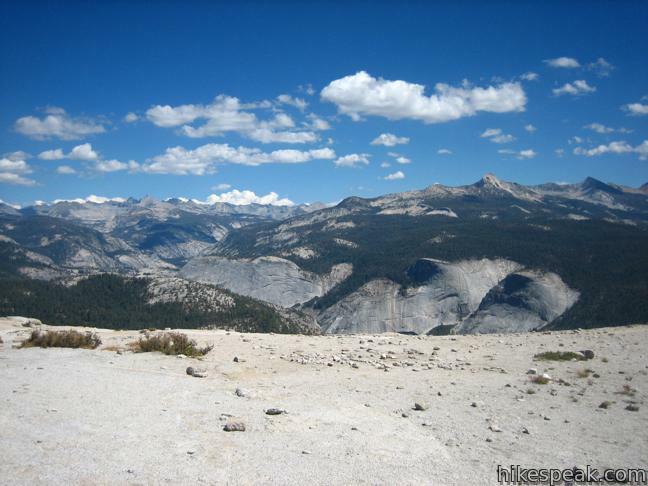 The flat area at the top of Half Dome is surprisingly vast, about the size of three football fields. The big open space has even bigger views. Green valleys and snowcapped peaks surround this 8.842-foot perch. Your starting point, Yosemite Valley, can be seen almost a mile below. To the west, Yosemite Valley stretches past North Dome, Glacier Point and more epic landscape. Half Dome offers a remarkable view, and if you’ve made the climb, you’ve earned it. Behold the grandeur of El Capitan and the full majesty of Yosemite. 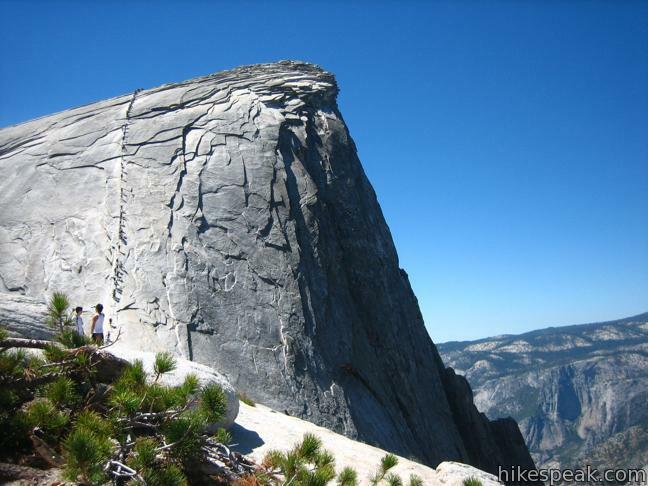 A point protrudes from the crown of Half Dome (like the imaginary face at the top of a peanut when you split it in half). If you are feeling brave, walk out onto “the diving board,” but be cautious. 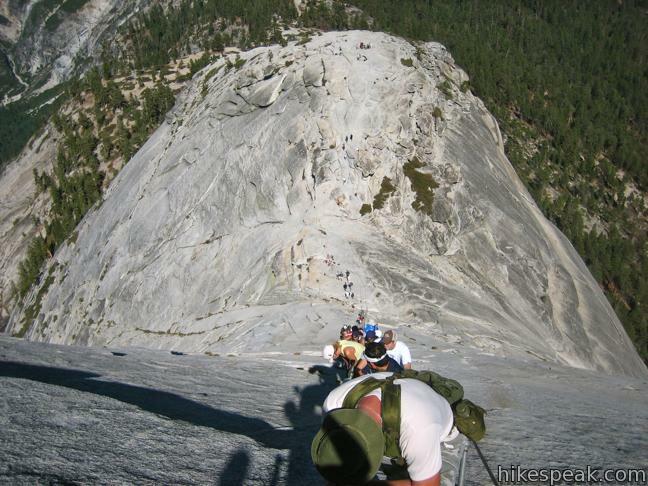 Visitors have fallen to their death from Half Dome, often by trying to get too close to the edge. Fear not, there is plenty to see from a safe distance. When you are ready to head down (you have earned the right to linger as long as you like! ), make your way back down the chains. You can face out from the rock now, and take in more of the view, but it is helpful to walk backward down the steep sections. Expect the descent to be a bit more challenging than the way up. At the bottom of the chains, return down the switchbacks, through the forest, and down the river past the falls to the trailhead. Pack lots of water. Then pack more water (at least one gallon per person). A filter to drink from the Merced River is helpful. The hike is best done as a one-day marathon, but you may divide the trek over three days by backpacking in four miles to Yosemite Valley Trail Camp, lugging more gear along the way. 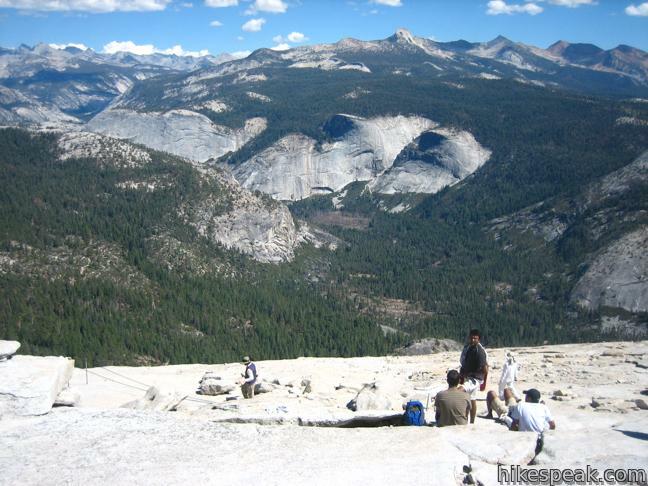 Other routes can be taken to the top of Half Dome, including following Panorama Trail down from Glacier Point past Illilouette Falls, down to John Muir Trail, and up to Half Dome (10 miles one way), or hiking south from Tenaya Lake on Tioga Road through the Yosemite backcountry to Half Dome (11.5 miles one way). The hike up Half Dome an unforgettable and exhausting achievement. Be careful and enjoy. The hike lasts a full day, but the memories last forever. To get to the trailhead: Drive into Yosemite Valley and park at Curry Village or another available parking area near Yosemite Village. Take the free park shuttle to the Happy Isles Shuttle Stop and walk across the Merced River to the start of the Mist Trail. A parking lot between Curry Village and Happy Isles may be open to backpackers, but setting out from here add about a mile of level hiking to your trek. 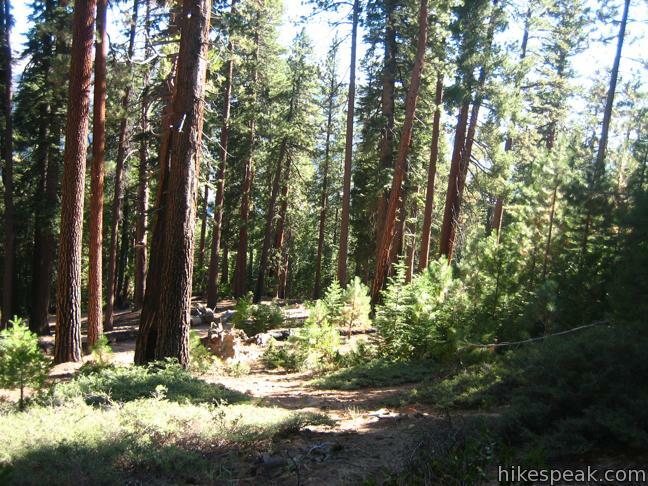 Or view a regional map of surrounding Sierra Nevada trails and campgrounds. These photos were taken in September of 2007 and May of 2011. Click to enlarge. 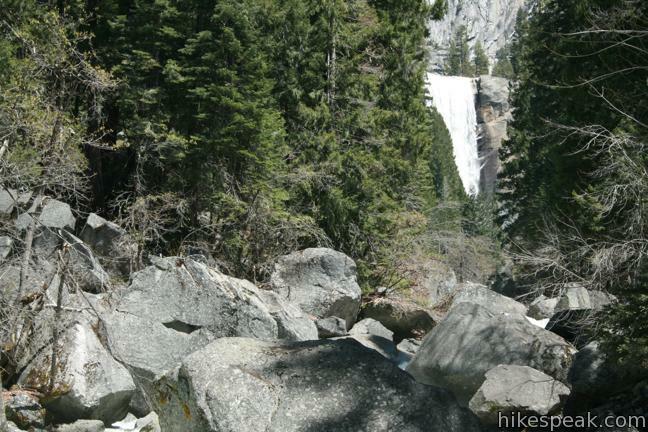 This 1.8 to 6.1-mile hike takes an exciting course past two of Yosemite's prize waterfalls. This easy 0.75-mile hike explores a pair of islands in the Merced River at the east end of Yosemite Valley. This nearly 10-mile long one-way hike travels from Glacier Point down to Yosemite Valley in the most scenic way possible. This 2 to 2.8-mile hike visits a reflective pool on the east end of Yosemite Valley. This 1.2-mile hike delivers visitors to the base of the tallest waterfall in North America. The experience is not to be missed. 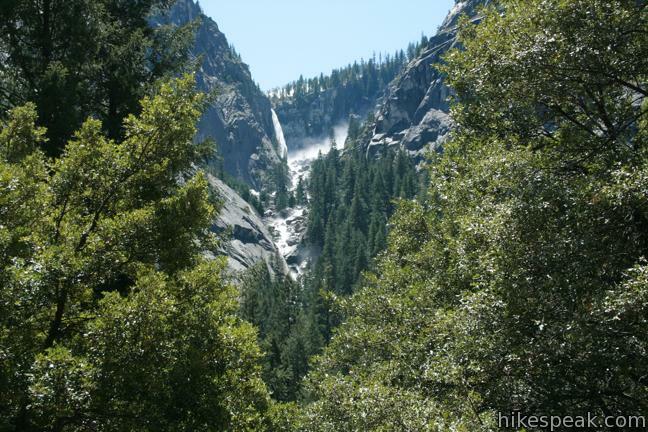 This 3.5 to 7.1-mile hike rises from Yosemite Valley past Columbia Rock to unforgettable views of Upper Yosemite Fall. 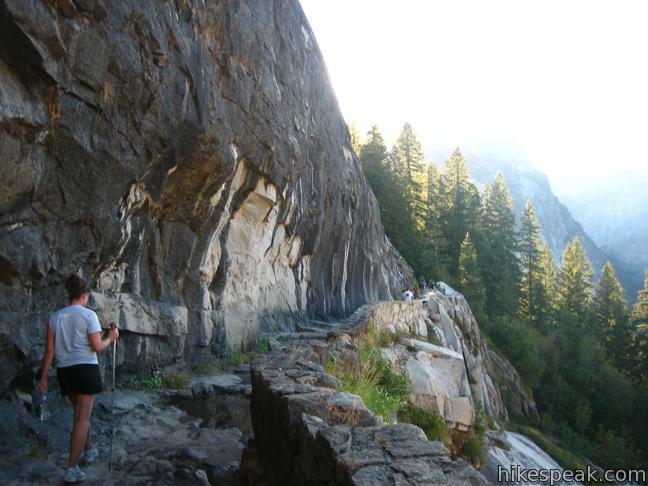 This easy paved half-mile trail visits the base of a 620-foot single-drop waterfall on the south side of Yosemite Valley. 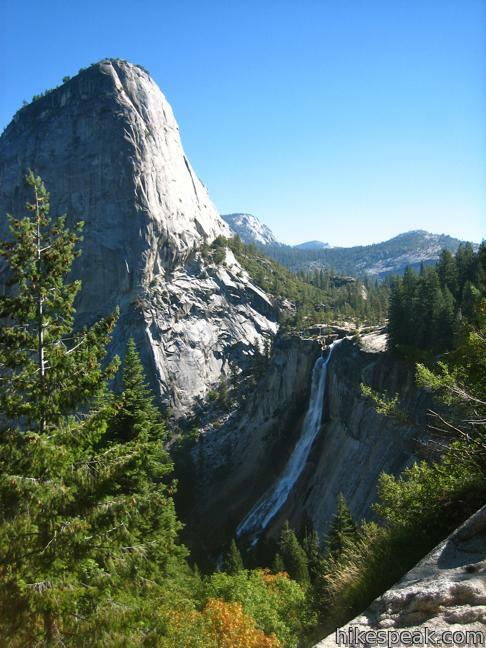 Explore other destinations in Yosemite National Park and the rest of the range. Thirteen campgrounds with over 1,600 total sites are spread throughout the park to facilitate your visit. What's not a hotel and not a campground? Housekeeping Camp offers a different type of lodging in the middle of Yosemite Valley. 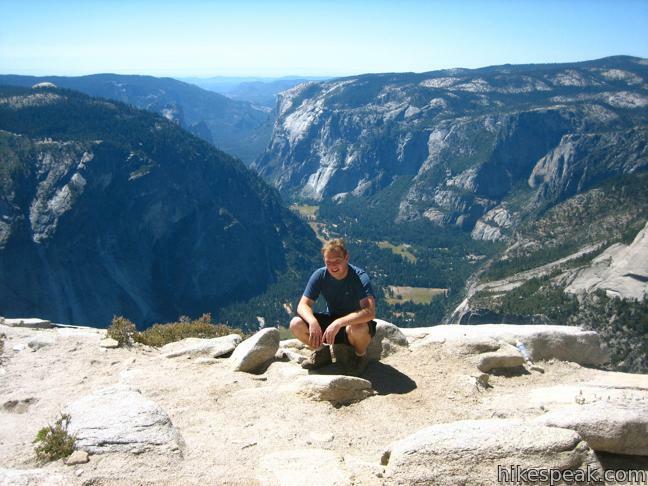 Yosemite…OH What a trip…..time to do it again! Was it better when you went in 2011 cause of the permit system on the cables or no? 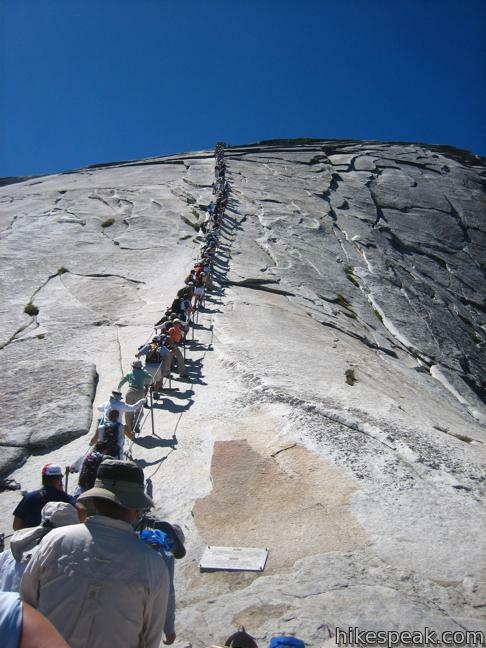 When I went up over Labor Day Weekend in ’07 before the permit system was in place, I had to wait in long lines to get up and down the cables. 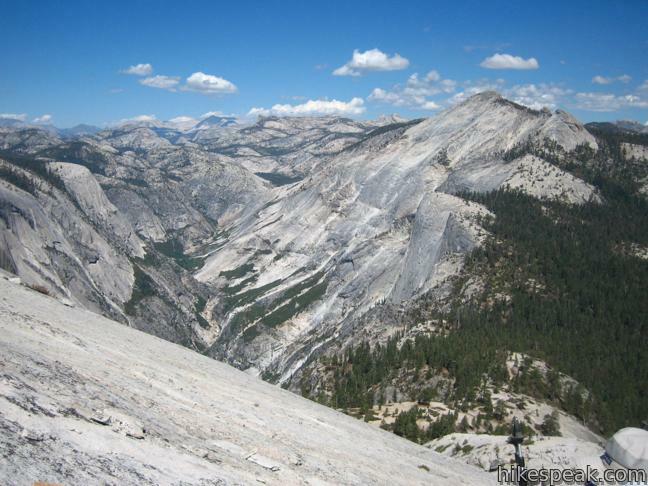 The current permit system probably needs to be improved to prevent scalping and to dissuade people from hiking up on Half Dome in bad weather. 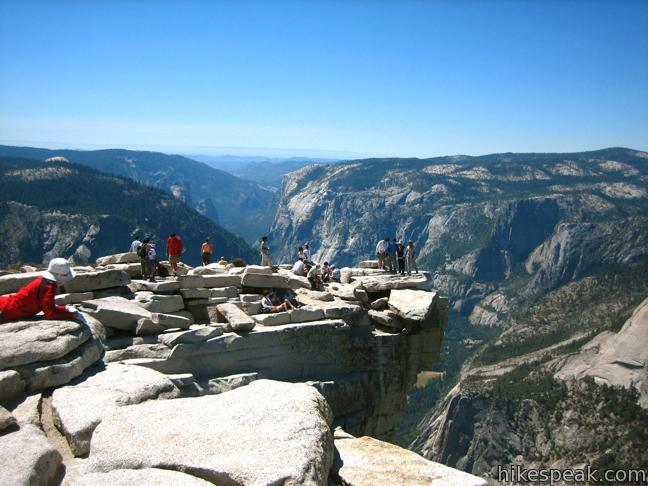 The view from the top of Half Dome is obviously incredible, but we think there are equally spectacular views and challenging hikes in Yosemite that don’t require navigation of the permit system. I have been to halfdome three years running. First time, no permits as we climbed on a Thursday and it was a circus. Think of walking through Disney like crowds for 16 miles… Crazy. Two years ago We went again and it was very different. We stayed in LYV campground and hiked up to see the sunrise. We were turned back by Rangers as someone had fallen off the night before. We Changed our plans and hiked up further into LYV. The place was deserted. Didn’t really run into crowds until mist trail heading back. 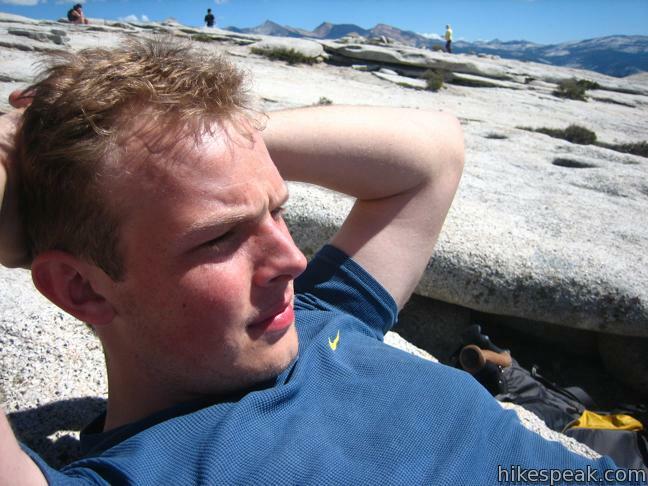 Last year (2012), Hiked again and stayed in LYV again. Climbed up for sunrise and stayed there for a couple of hours. ON the way down saw some hikers that had climbed without a permit being bagged by a ranger with a $350 fine each… It is way better now that you have to have a permit. Get one and get up there. The cables are a trip if you don’t have any upper body strength. Email me if you have questions. mwellington@brookwood.edu. ps… Going again this year!